Matt van de Rijn is the Sabine Kohler, M.D. Professor of Pathology at Stanford School of Medicine, and a renowned translational research scientist. His clinical Focus is in Anatomic Pathology and Sarcoma. His contributions include seminal studies on the pathobiology and molecular characteristics of gastrointestinal stromal tumor, tenosynovial giant cell tumor, leiomyosarcoma, MPNST, and rhabdomyosarcoma among other soft tissue tumors. Many of his studies have resulted in the development of novel markers for clinical application. He received his medical education at Universiteit Van Amsterdam (1986) Netherlands. 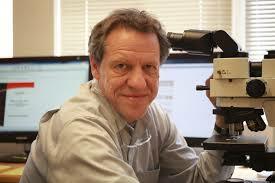 He has been Board Certification in Anatomic Pathology by the American Board of Pathology since 1993. He completed his residency at Stanford University School of Medicine and Fellowship at Stanford Hospital and Clinics in 1994.